Actor/musician John Stamos has shared a message of defiance with fans online after experiencing the aftermath of the terror attack in Manchester, England on Monday night (May 22). The Fuller House star reveals he has been staying in a hotel less than half a mile (805 metres) away from Manchester Arena, where a suicide bomber targeted fans exiting the venue following an Ariana Grande concert. 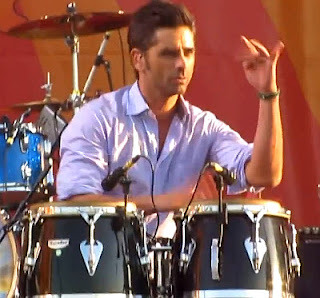 Stamos is in town to perform with the Beach Boys, for whom he has become a frequent backing player, at the Open Air Theatre in nearby Scarborough on Wednesday (May 24), and he has been left shaken to the core by Monday's tragedy, which left at least 22 people dead and dozens of others injured. "I can't help but think of these young kids who just wanted to go to a concert and sing and dance and be taken away if just for the night," he shared in a lengthy post on Instagram on Tuesday. "I was one of those kids doing the same when I was young hanging out at Beach Boys shows. The songs may be different... but it's the same joy those young kids felt Monday night in Manchester." The 53-year-old continued by describing live shows as "enduring symbols of freedom and liberty", admitting his "heart aches" for all of the Grande concert-goers, who had just wanted to experience a good time. Stamos ventured out of his hotel room on Tuesday to visit the area by Manchester Arena, and as he pondered how to "make sense of such a horrific tragedy", he noticed a police officer sitting on a bench with a young kid - and the sight was enough to comfort him. "It reminded me that compassion and love will always conquer hate," he explained beside a photo of the cop and child. He then dedicated his next show to those affected by the bombing: "I will play with The Beach Boys tomorrow night in memory of all those we lost and as a prayer for the strength to carry on in these troubling times," Stamos concluded. "Manchester will be in my heart now and always."